New York, NY - Detectives from the NYPD are seeking to interview a terror suspect being held by the feds in connection with a brutal stabbing of a 9 year-old Staten Island boy in January, an attack investigators say may have been an audition for ISIS. 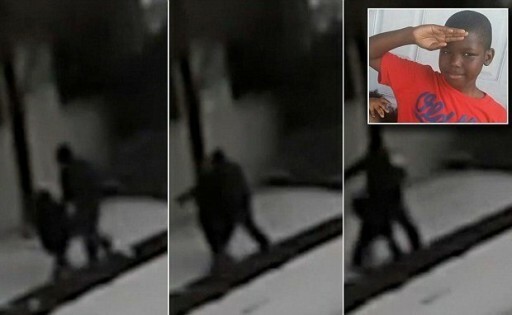 NYPOST.com (http://nyp.st/1PqFUKm) reports that the attack on Jermaine Culver—-who was jumped and stabbed five times in the neck while on his way to school on January 9—-went cold despite the NYPD distributing a grainy image of Jermaine’s attacker taken from nearby home surveillance video. NYPD cops believe a Staten Island terror suspect arrested by the feds in June, 21 year-old Fareed Mumani, may in fact be the perpetrator of the attack on Jermaine Culver. Alleged statements made by Mumani to the feds exposing “violent jihadist beliefs,” along with the fact that he fits the description of the suspect in the home video surveillance in the Culver attack, have landed him on the NYPD’s “person of interest” list in the case, but to date the feds have been uncooperative in allowing investigators to interview him. Hussain Obama will not let the NYPD put its hand on this terrorist because in his twisted mind there is no such a thing as Islamic terror. When did the President call you up and tell you this? Are you the yingel fin dorf? or maybe Yetachmiel? you sound like one them. He actually told it to the whole nation on national television when he refused to acknowledge Islamic terror as such. The Fort Hood shooter? San Bernardino? Stop drinking the coolaid, we have a monster in chief as president. How can you still defend the O?